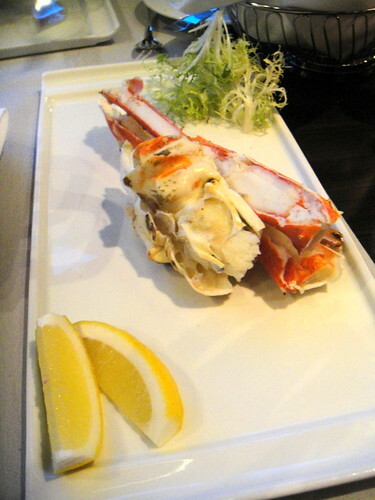 After our first awesome seafood feast, we returned again for another yummy meal at Club 21. This time, our server wasn’t as professional and friendly as last time’s which put a little bit of a damper to the mood of the evening (great service and pleasantries are so important to a night out!). We were placed in a two-person table whereas other parties who were in a party of two got a four-person table. Why did we get a smaller table? With everything that we ordered, everything fit perfectly with little space to budge. Our view from last time was exceptional as you may recall and this time — not so much. 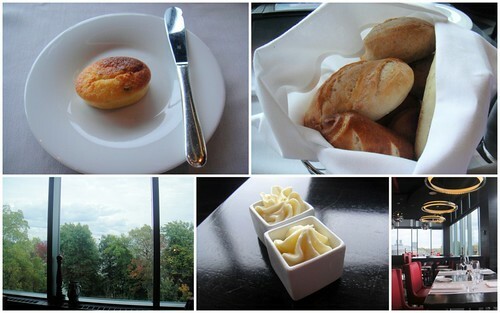 We received the delicious and abundant basket of bread once again with that yummy and decadent spicy corn bread. After loving the perfectly shucked and juicy oysters from last time’s Seafood Tower, we ordered 8 oysters this time a la carte. They didn’t have any west coast oysters so we stuck with the east coast ones (here is where the server was a bit ‘rude’ — I asked him if I could have an even split of 4 west coast and 4 east coast oysters and he snapped back at me to tell me they only had east coast ones. Well, geez, how was I supposed to know that). 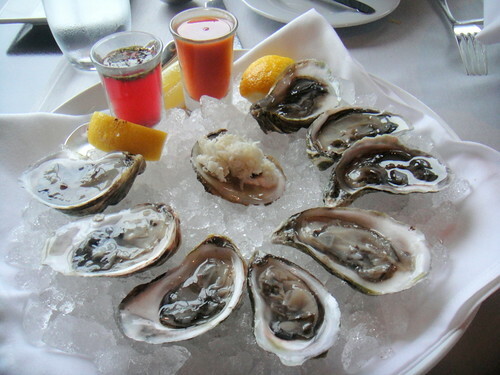 In any case, I loved the oysters as they were just as tasty and plump as the ones we had last time. We ordered a clam chowder soup. It was so fancy. 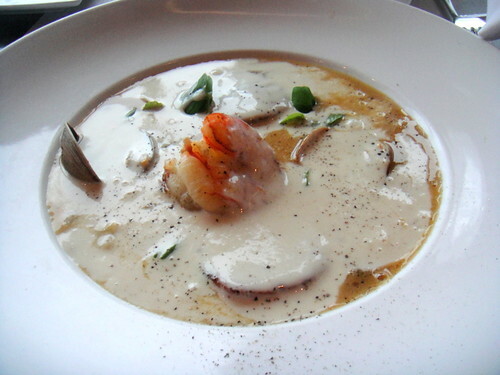 The server brought forth a deep plate with scallops and shrimps already in the plate before pouring out the hot chowder from a tea pot into the dish. It was elegant and delicious! We ordered quite a few starters this time. Up next was the crab cake. This didn’t look as impressive but when you cut it apart, the crab cake was made of all crab meat that was fleshy and tender. I’ve never had crab cake like this before. Usually, I’ve had ones that are fried on the outside like a patty and the inside contains minimal crab. 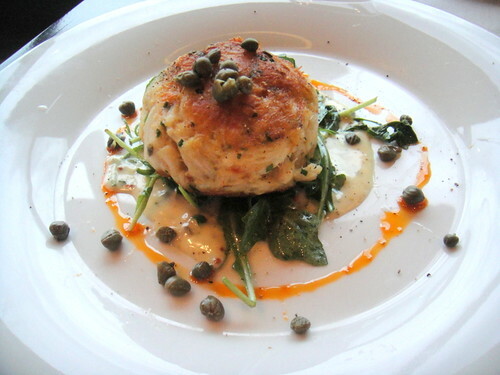 I really enjoyed this type of crab cake. The only downside was that it was a little bit flavourless. 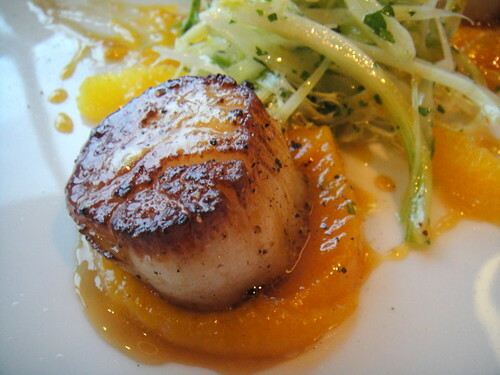 Scallops finished off our impressive starter set list. 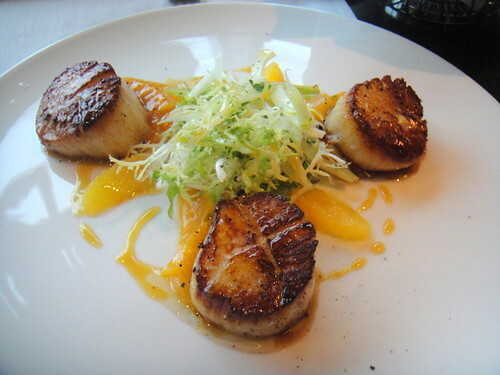 These scallops were huge and reminded us of the three big ones that we had at Ponte Vecchio. They were just as juicy and soft but weren’t as tasty in comparison without the strip of bacon wrapped around the scallop. 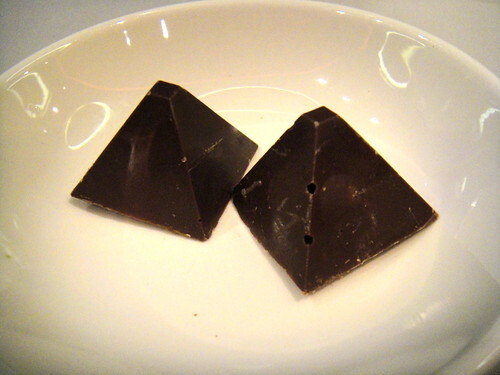 Instead, there was apricot puree underneath each one as garnish. Sweets to finish off the night! 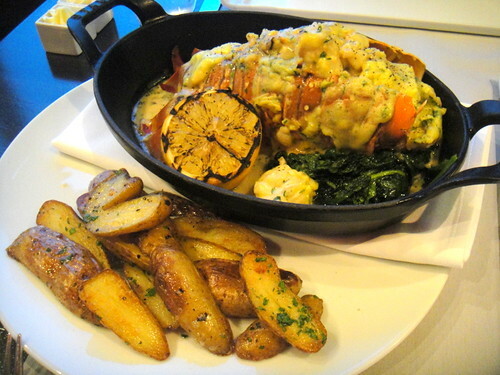 This entry was posted in Food and tagged @NiagaraCasinos, Alaskan king crab, Canada, clam chowder, Club 21, crab cakes, Fallsview Casino, Fallsview Casino Resort, food blog, foodie, lobster thermidor, Niagara Falls, Ontario, oyster, restaurant review, scallops, seafood, steak, Western. Bookmark the permalink.